Awarded at Maadi (National Champs) since 2003 to the Champion sculling school, the Scull is currently held by St Peters School [STPC]. This trophy is awarded to the school that is awarded the most points in all 'A' finals in sculling events at Maadi. Points are awarded as follows: 1st = 5 points, 2nd = 3 points, 3rd = 1 point. 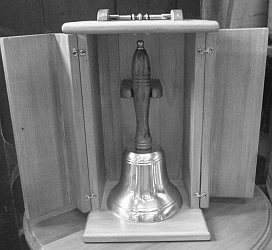 Awarded at the South Island Champs since 2015 to the Champion school of the regatta, the Bell is currently held by Christchurch Boys High School [CBHS]. Presented by rowIT Ltd to acknowledge the importance and growth of school rowing in the South Island. Awarded at Maadi (National Champs) since 2003 to the Champion sweep oar school, the Trophy is currently held by Hamilton Boys High School [HAMB]. This trophy is awarded to the school that is awarded the most points in all 'A' finals in sweep oar events at Maadi. Points are awarded as follows: 1st = 5 points, 2nd = 3 points, 3rd = 1 point.